Sorry, we couldn't find any Hanover Nissan listings that matched your search criteria. Hanover Nissan provided me with great service. The staff was friendly and most accommodating. My sales person, Josh, went over the top to answer my questions and help me during the process of buying my car and more importantly after the sale. He is a real asset to Hanover Nissan. My only problem is the fact that I live 80 miles from the dealer, so I probably will not be able to take my new car there for service. If you see a car listed on CarGurus from Nissan Hanover that you're interested in give them a call...you won't be disappointed. Best car buying experience ever! 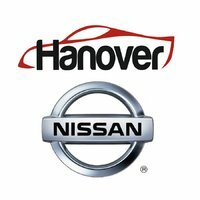 The team at Hanover Nissan were extremely helpful and professional. They had the vehicle prepped, cleaned and paperwork ready when I walked in the door. Keep up the good work! Brandon, thank you for your kinds words! It was our pleasure to service you! Jesse was great to work with, very personable. His follow up was wonderful. Thank you so much for choosing Hanover Nissan. It was a blast working with you! Thank you for your purchase and we look forward to serving your again in the future!